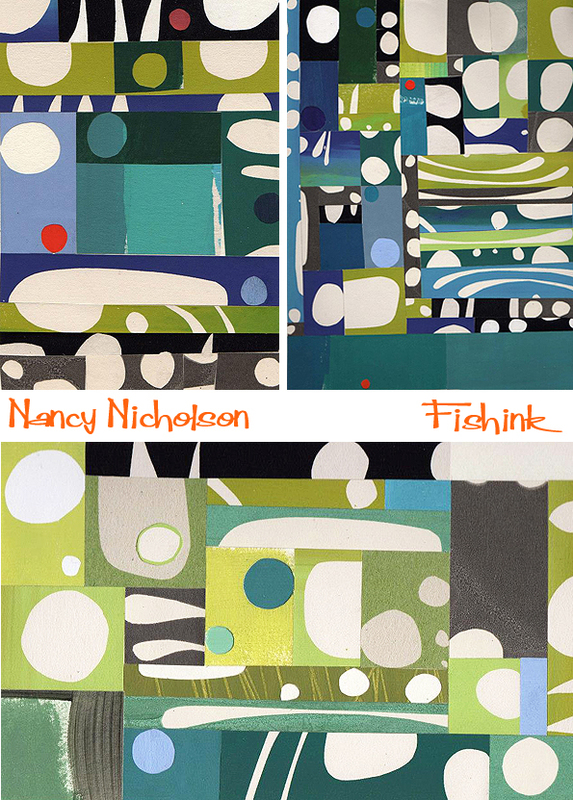 For a while now I’ve admired the work of Nancy Nicholson. 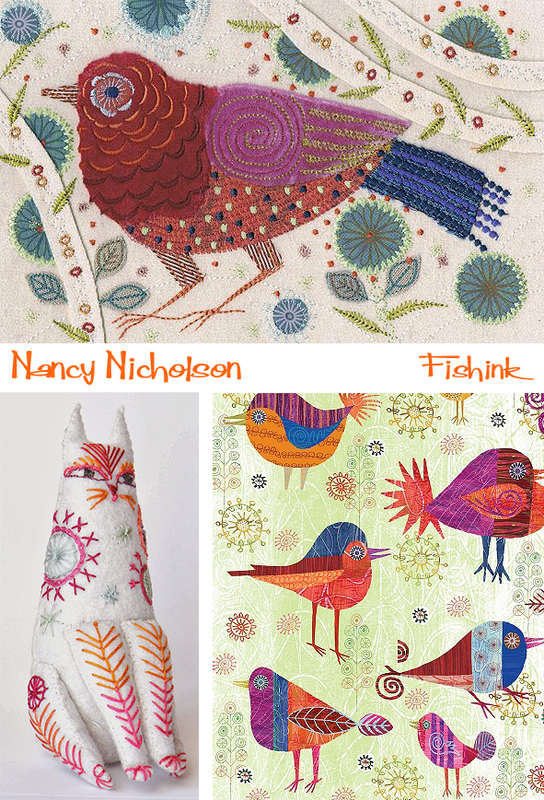 She has established a reputation for her work in textiles, whilst more recently has been designing in paper and card. 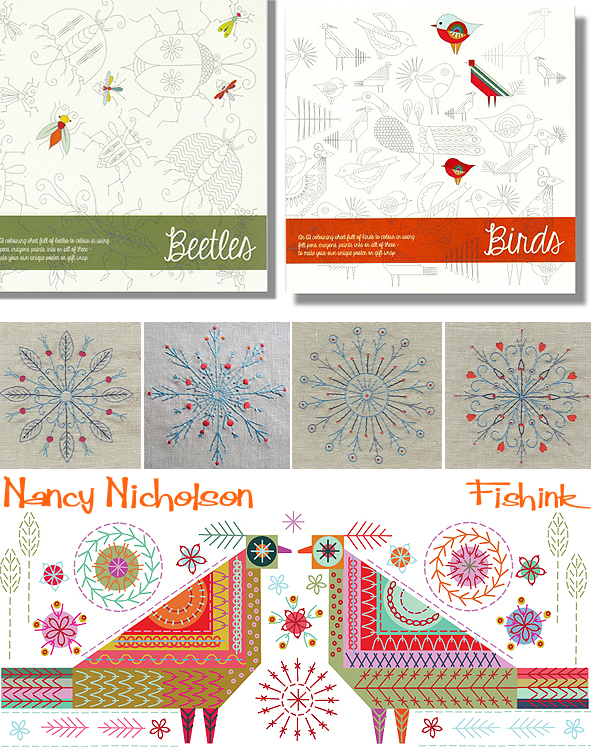 Her recent range of interactive stationery and sew kits use her own designs as well as taking inspiration from her late mother Joan Nicholson’s work, who was a leading figure in the revival of stitch crafts from the 50s through to the 70s. Whilst Nancy’s father Roger Nicholson was best known as a professor of fine art textiles at the Royal College of Art, but who also painted intensively and privately, and whose work is now increasingly collected. You can find out more over at Quad Royal. 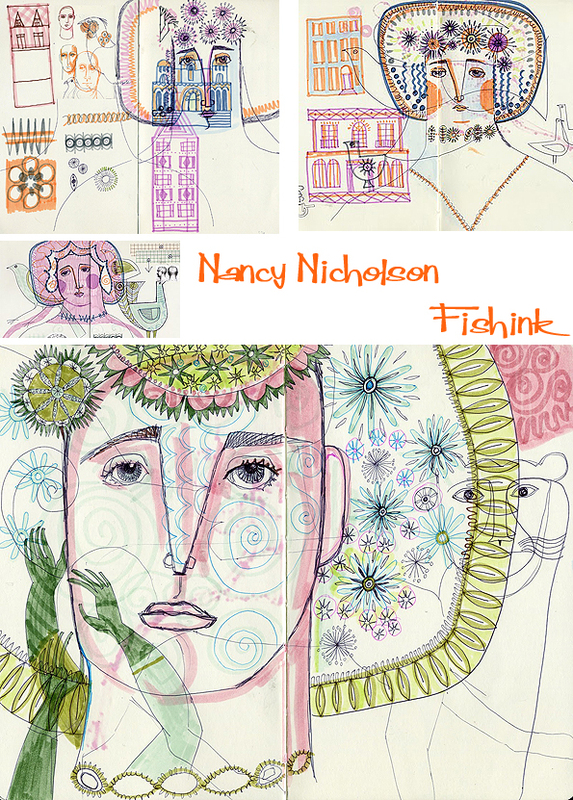 I got in touch with Nancy to discover more about her work. 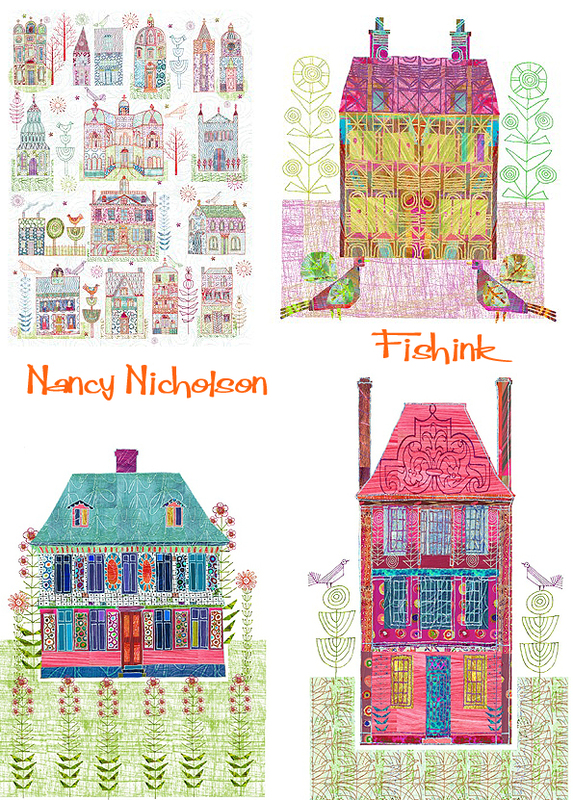 I love the colours and balance in these screen prints and drawings. What is your story as an artist, how did you start and what training led you to this point ? I grew up in a very bohemian environment. Pretty much left to my own devises, but my mother encouraged me to make things from a very early age. Sorting out her brightly coloured pins and button box, making little garments for tiny little dolls, little bits of fabric and thread treasures for a small girl. I remember making a whole nativity out of paper and sitting up in bed till the whole night to finish it ! I went to Maidstone Art College and studied Graphic Design, but was allowed to work in other disciplines. 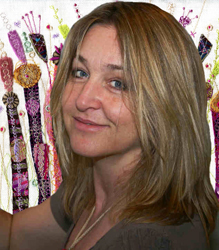 as textiles was not a subject they had then … I later went on to study Textiles at Royal College of Art. How do you start designing… sketchbooks, research, library, internet etc ? Sketchbook first, usually in bed with tea, early morning. Then I scan those images into the computer and work them in Illustrator until I have the design right. Sketchbook work is very indulgent for me and I have two, one for just play and one with working drawings and notes. There’s a great colour scheme that runs throughout your work, sketchbook etc is this intentional or are you just using a pallet of colours that you select subconsciously ? I love colour, who doesn’t, and I am aware that my palette is very distinctive. It is very hard to break away from a comforting family of colours, but the next new kits will challenge my default setting! In terms of consistency I do think it is important to have a recognizable “story”, and to keep a thread running through your work in terms of colour. Of course it is then easy to move within those restraints. Who are your inspirations / blogs you follow and designers you’d like to meet or perhaps work with ? 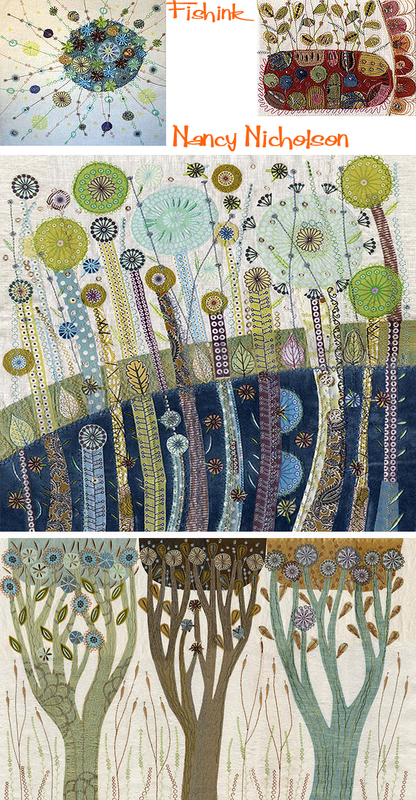 I have many starting points and obsessions, but I have always loved folk art, both textile and illustrations, Russian children’s books, my mother and father, Joan and Roger Nicholson both textile designers, have always been enormously influential to me. I have a vast archive of images and collections of books on everything textile, folk embroidery, costume, toys, typography, graphics past and present, illustration …. Where to stop? 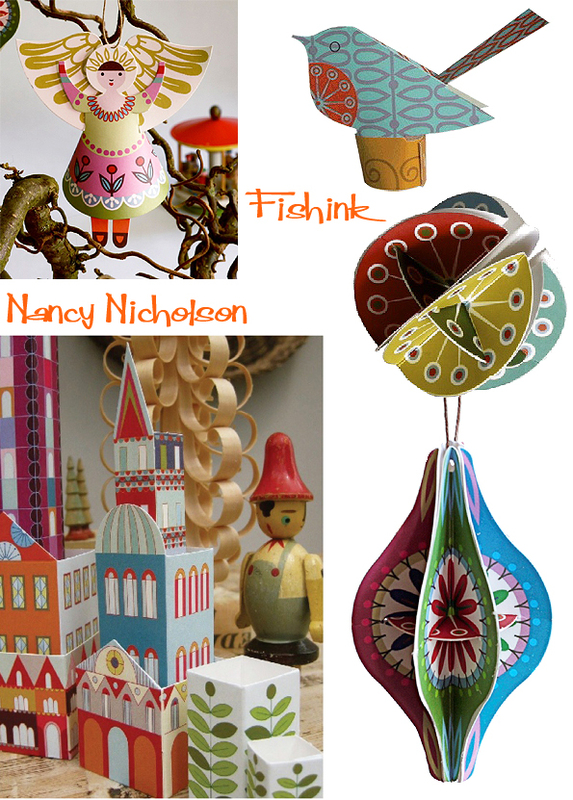 Nancy’s sewkits are a beauty to behold. I’m even tempted by mister cat ! Where did the idea for your wonderful kits stem from and are there plans for a future empire of cats, birds and teapots ? : ) I initially launched my Interactive pop out cards in 2012 and they did quite well, and I am still hoping to produce my paper products. 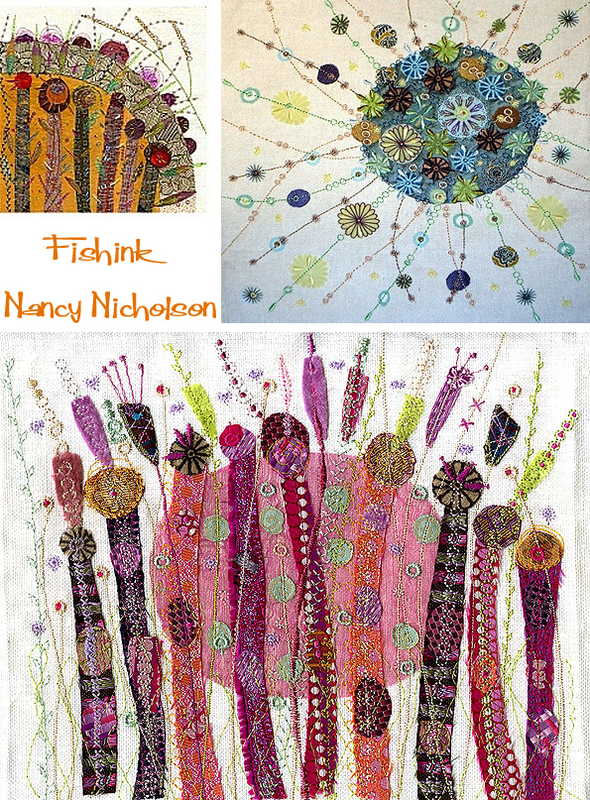 At the time I was creating my one-off intricate machine embroideries, which was the style of work I have been doing for a good 10 years, selling at exhibitions and to private collectors, but it occurred to me that I could make simpler hand embroidery kits of the images for people to make the designs up themselves. 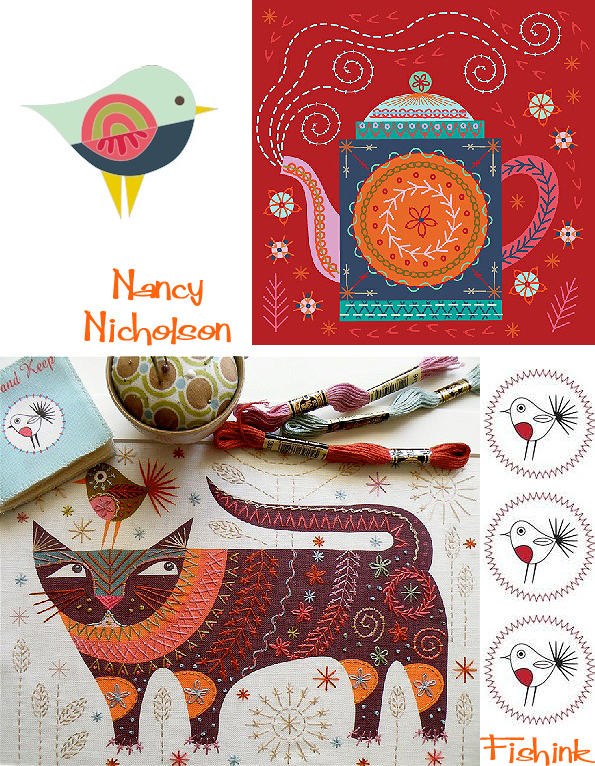 So I designed the Cat and Bird and they were so popular I moved on to design the Lovebirds and Teapot last year. 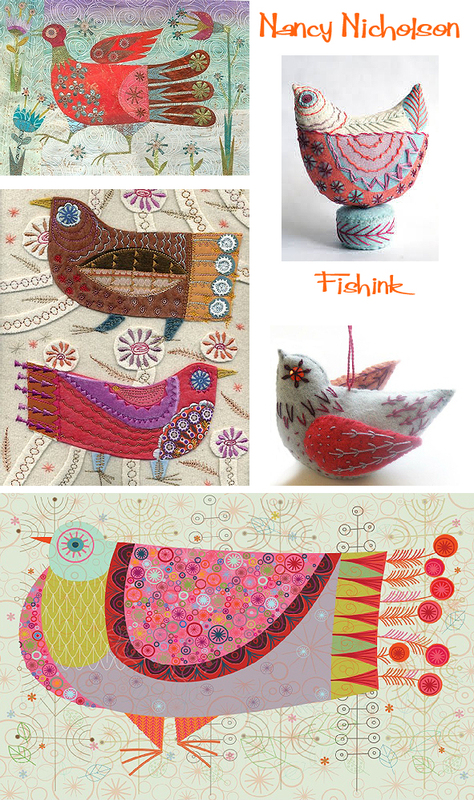 I am just about to launch two large cushion designs, two 3d stuffed birds, and a range of stitch cards, all ready by the end of May. Very exciting …. There are plans to bring out some more designs which will be flower based designs by Christmas 2014. I have quite a few downloadable kits online and would love to develop these further, but my customers still prefer a real kit at the moment. Her drawings have also led to colouring books. Feast your eyes on these wonderfully rich and detailed embroidered pieces. The word ‘sumptuous’ comes to mind : ) Plans for the future ? where to next ? I have been lucky enough to be part of a business course since October (School for Creative Start ups) and we are showcasing our new businesses at Selfridges Hotel ….. I am really hoping to expand and sell to larger retailers, and to develop my designs to many areas of the homes market, but focusing on good design and craft. I would love to extend my designs into fabrics and paper goods also, meet new people and aspire to greatness generally. Come along to the Make Good Festival at 30 May – 1 June 2014 at Old Selfridges Hotel, London. It looks great Nancy, pity it’s a little far for me to get to, I’m sure some of my London based readers will check it out though. Do have a great festival and thanks again for taking part in my blog. 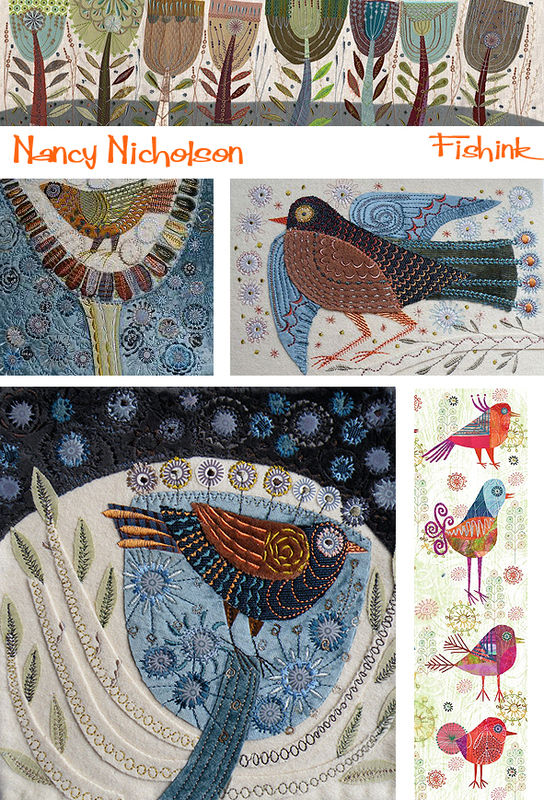 We’re still not finished as I’ve been saving the best til last, aren’t these bird embroideries simply stunning ? 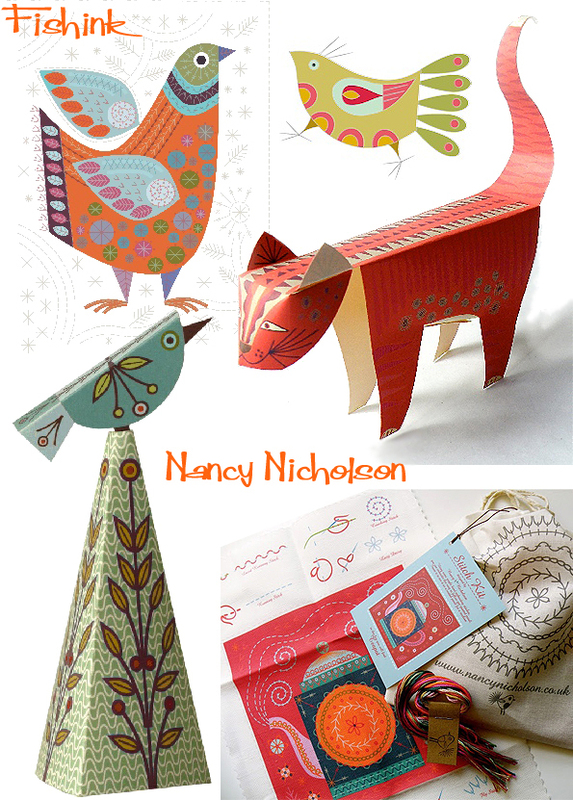 You can follow more of Nancy’s thoughts and projects over on her Blog here. My Pleasure Josie, thanks for your comment too.